Whoever scorns painting is unjust to truth; and he is unjust to all the wisdom that has been bestowed upon poets—for poets and painters make equal contribution to our knowledge of the deeds and looks of heroes—and he withholds his praise from the symmetry of proportion, whereby art partakes reason. Philostratos, a Greek philosopher trained in Sophistic technique, is invited to Naples in the mid 3nd century AD to participate in the inauguration of a stadium by a prominent Roman senator. Philostratos arrives in Naples, is happy to see that the city is friendly to Greeks and is Hellenic in culture and language. 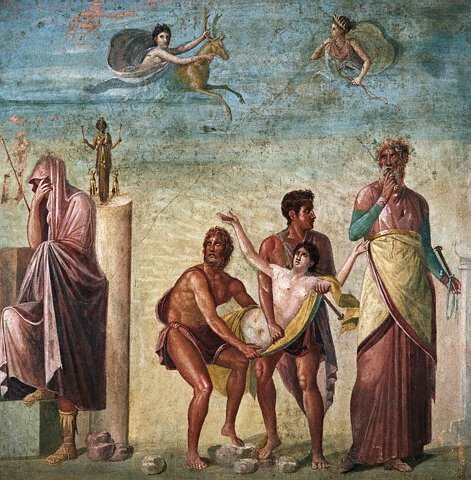 Philostratos enjoys the hospitality of his host, who possesses a beautiful villa overlooking the Bay of Naples, which houses an extraordinary collection of paintings. Philostratos sees the yearning curiosity of the senator’s son, and gives him a guided tour of the collection. Philostratos thus goes from one painting to the next, explaining the story of each painting in a successive progression, to the boy. It is an intimate journal of a philosopher poet’s perceptions of beautiful works of art in the collection of his host. There are many works, and Philostratos approaches his painted subjects as if they breathe the same air as he, as though they step into the space of reality as easily as they remain as fixed images upon a wooden panel in a pinacoteca. He has a visceral relationship with the subjects he describes since their space is not confined to that of a two-dimensional surface; instead they break out into a vaster space, that of an historical/mythical continuum, which ever fixes the notions of ethos (character), telos (the end or crucial moment) and mythos (the narrative). Ancient painting consisted of these three ingredients, and although painting has evolved a great deal over 2,000 years, those elements remain steadfast in many a contemporary work. It is the intention of this exhibition to incite contemporary painters to tackle these ancient texts and create their own works which reflect their inner reaction to the descriptions of works “lost”. It will be their effort to recreate these works in their own image and identity….in relation to the contemporary world in which they live. Although remote insofar as time is concerned, the artists of ancient times shared many of the concerns of contemporary artists, not only in their own well-being, but in their aesthetic concerns. Ancient painters wished to move their audience and convey pathos and tragedy, comedy and contemporary life, irony and sincere emotion. By creating connections passing through many historical ages, we reaffirm our pursuits today with contemporary painting, as an act which extends from our primary humanity to the post-industrial, complex, and incomprehensible future.